The 103rd Farm Show wrapped up last weekend after hundreds of thousands of visitors walked through the doors at the Farm Show Complex near Harrisburg. 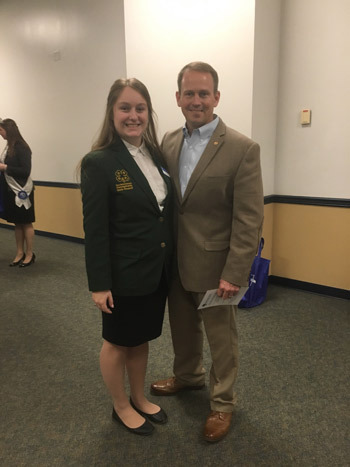 I visited the event and had the chance to meet up with several residents who either entered their animals or products in competitive exhibits, participated in the many interactive contests, took in the entertaining and educational displays, or tasted the hundreds of different food items made right here in Pennsylvania. Locally, the 57th District is boasting a lot of winners at this year’s Farm Show. Be sure to check out the list on the Farm Show website. The site also includes hundreds of photos from the week, categorized by competition. This week, the House Committee on Committees met to finalize assignments for the 27 standing committees to cover the 2019-20 legislative session. This term, I will be serving once again on the Aging and Older Adult Services, Consumer Affairs, Human Services, and Labor and Industry. I will also be serving again as deputy chair of the Policy Committee. In a new role, I will be chairman of the Pennsylvania Legislative Gas and Oil Caucus. These assignments allow me to have a greater insight into the legislation and issues discussed and help me better represent our district. All bills are assigned to a standing committee to undergo review. Committees may hold hearings on legislation, consider amendments to pending bills and report them to the full House for a vote. PennDOT is sponsoring an extensive Summer Maintenance Program for college students. The program runs May through August 2019 to supplement the permanent workforce. These students assist in completing summer maintenance work and sign upgrade services, provide maintenance and custodial services at roadside rest facilities, and perform laboring and flagging duties in maintenance organizations and highway worksites. To be eligible for consideration, candidates must be at least 18 years of age, enrolled as a full-time college student for the fall 2019 semester and have a valid Pennsylvania driver’s license. The hourly rate is $13.56. If interested, please contact my office at 724-834-6400 no later than Friday, Feb. 15. Candidates must also apply online at employment.pa.gov in the “Summer Maintenance Program” category under the Open Jobs section of the website. All PennDOT driver license and photo centers, including the full-service center in Harrisburg, will be closed Saturday, Jan. 19, through Monday, Jan. 21, in observance of Martin Luther King Jr. Day. Customers may still obtain a variety of driver and vehicle products and services, including all forms, publications and driver training manuals, online through PennDOT’s Driver and Vehicle Services website, dmv.pa.gov.